Aon plc (NYSE:AON) says that its new Health Survey shows that 93% of employers across the Europe, Middle East and Africa (EMEA) region see a correlation between health and employee performance. However, just 13% of respondents measure outcomes of current employee health strategies and 69% say limited budgets are the biggest challenge to implementing health strategies. The report is the first and largest of its type. Five hundred HR directors and risk managers responded from 22 countries across EMEA. Overall, the findings pinpoint areas for improvement and make recommendations to increase health benefits take-up, improve measurement on the impact of health initiatives and to maximise the return on investment that firms make in employee health. 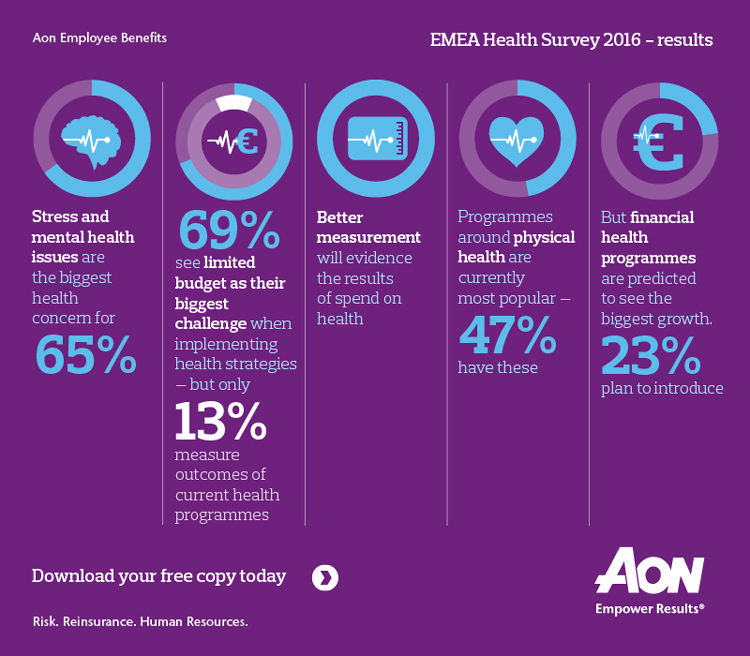 Aon’s survey showed similarities, and marked differences, of organisational approaches to employee health across the EMEA region. 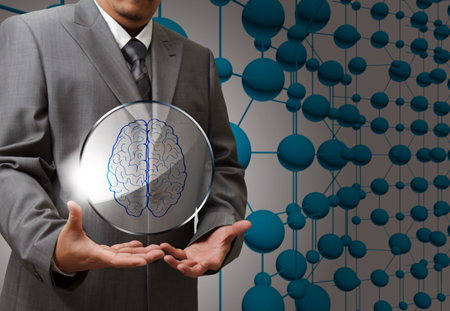 Sixty-five per cent of respondents agreed that stress and mental health are the health and wellness issues they are most concerned about today and for the future, although only 32% of employers have emotional/psychological health programmes in place. Fifty-three per cent say that employees’ physical health is the biggest issue, while unhealthy employee lifestyles are judged to be the biggest issue by 49%. “With stress and mental health issues commonplace and the biggest recognised health issue for employers, it is disappointing to see that less than a third of respondents are addressing this with emotional or psychological health programmes. Helping to support the mental wellbeing of employees is crucial if they are to remain happy, present and productive. “Financial health is a growing topic of conversation and predicted to be the largest growth area in terms of employer-provided health programmes. We are certainly witnessing the more progressive employers implementing programmes that integrate the physical, emotional, social and financial aspects of wellbeing. Many employers understand that a person’s financial issues impact their wellbeing, stress-levels and ability to perform, and indeed 23% of employers are looking to put programmes in place to help employees manage money more efficiently. Overall, using data and analytics to make informed decisions based on an organisation’s unique needs and circumstances can effect change on employee health and employer costs, and help shape the employer’s strategy going forward”. In the technology industry, attracting and retaining talent is the biggest challenge – 75% versus 50% average. The study also showed that employer priorities include increasing productivity and employee performance (52%), attracting and retaining talent (51%), improving employee engagement (49%) and reducing or managing costs (44%). Employers are far less concerned about tackling long-term absence (4%), developing corporate social responsibility (4%) and managing job mobility (7%).